Not only is this case durable but it also looks good! The 22" Expandable Rollaboard Suiter has a lightweight frame and it expands an extra 2.5 inches providing 30% more packing room than the standard suitcase. 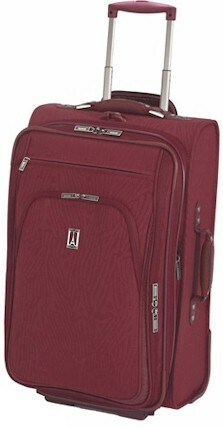 The cushioned handles, complimentary toiletry kit and cosmetic case make this carry-on a user-friendly piece of luggage. On the Outside, this piece is handcrafted from durable, lightweight, poly ballistic nylon. Some features include; award winning full length expandable "no tip" foot with handle cup for easy lifting. Cushioned top and side carry handles along with the comfort grip, retractable handle. Alligator patterned embossed leather trim combine style and fashion. Exclusive, EZ glide ergonomic zipper pulls are built to last. There's a fully lined interior with water resistant lining. And free, water resistant, fashionable, removable ladies travel bag and toiletry kit come complimentary with the collection. These features found through out Travelpros Runway collection.